Some days, you just need your friends. Friends you can count on to be there when you need them. And, being with these friends makes everything all right. 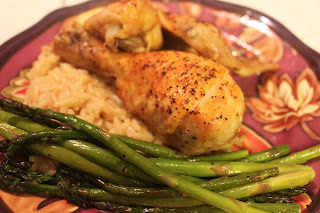 I want you to meet my friends - baked chicken and roasted asparagus. Don't laugh...I needed them this evening after a long week at work and they came through providing me with the familiar comfort I so desperately craved. I used a cut up fryer and a package of chicken legs. When you have little kids, you can never have too many drumsticks. I seasoned them with my trinity of seasonings: seasoning salt, garlic salt, and course pepper. 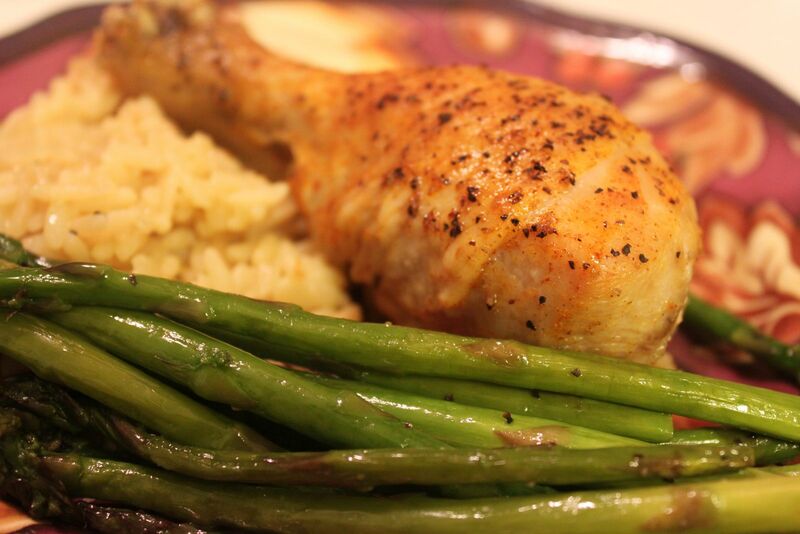 After seasoning, I covered the chicken with foil and baked for about 40 minutes at 350 degrees. After 40 minutes, I removed the foil and cranked the oven up to 425, letting the chicken cook for another 20 minutes until the skin was golden and crisp. Meanwhile, I prepared my asparagus by chopping off the tough ends, laying them on a large piece of aluminum foil sprayed with cooking spray. I drizzled with olive oil and sprinkled with pepper and kosher salt. Since I had the chicken in the oven, I decided to let Eric cook the aspargus on the grill. 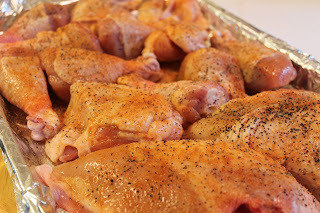 We wrapped them up in foil and he cooked them on medium heat for about 20-25 minutes, depending on desired firmness. 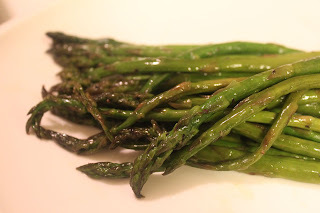 I have also roasted asparagus in the oven by putting them in a shallow baking dish and roasting at 400 degrees for about 20-25 minutes. 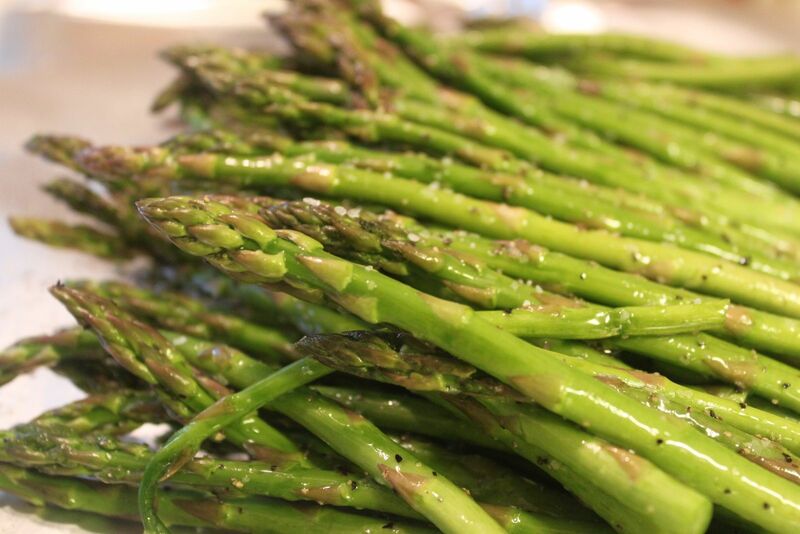 Asparagus is a beautiful thing. We gathered round the table, talked about old times, laughed out loud, and left satisfied. Leave it to Kim to have the ability to make me think I WANT asparagus! LOL :-) Thanks for the chocolate chewy today! It was YUMMY!! Asparagus is wonderful. You don't know what you're missing.